On Friday, November 6th, Amsterdam was once again the host city to the World Demolition Awards, one of the most exciting events of the year for the demolition industry. Demolition contractors from around the globe met to share ideas, tackle issues that affect the industry, and celebrate the truly amazing international demolition accomplishments that have taken place over the past year. While they did not bring home a trophy, Costello Dismantling was a finalist for the Urban Demolition award, in recognition of their unique demolition of a heavy underground turntable and roundhouse in the heart of downtown Boston. Congratulation to UK based Erith Contracting for the Urban Demolition award and all other award winners and entrants. It is a great honor to share the stage with these world class contractors. 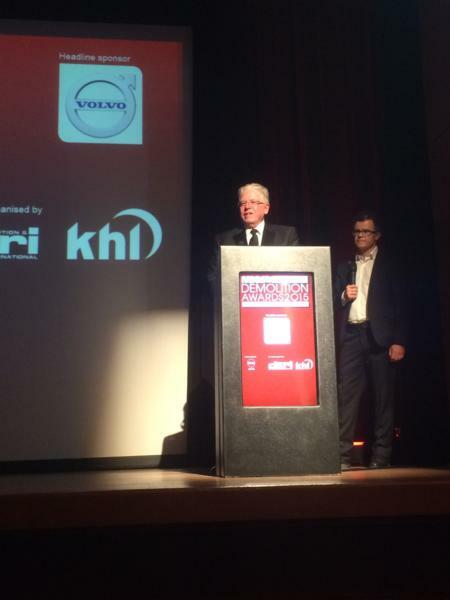 Dan Costello was once again a judge for the demolition awards, and was proud to present three of the awards handed out in Amsterdam this year. In the category of Innovation for Plant & Equipment, the first award went to JCB & Coleman, Inc. of the UK, for developing and adapting a JCB excavator for remote controlled, heavy lift applications in a challenging London Underground project. Protranz Earthmoving Ltd. of New Zealand was presented the second Innovation award for adapting an excavator for remote controlled demolition of damaged structures in a very sensitive earthquake zone in Christchurch, NZ. Dan presented the Environmental & Recycling Award to AR Demolition of the UK for demolition and remediation of the former Brackley Sawmills. Costello Dismantling would like to exend our warmest thanks to D&RI for hosting a fabulous conference, the sponsors – particularly Volvo Construction Equipment and Walt Reeves – for making the conference a truly world class event. We especially thank Lindsay Gale for putting his heart and soul into developing this event into the masterpiece that it has become. We hope to see you all next year as the World Demolition Award shifts venue to Miami, Florida. Follow the links below to learn more about Costello Dismantling's shortlisted project in the Urban Demolition category.